After many years of experience in the semi-trailers and trailer field Jan Lageschaar decided to start his own company in 1986. From the exciting beginning a team of enthusiastic business people have now established a tailor-made job. After the start of a maintenance and MOT business on a variety of vehicles and the production of semi-trailers and trailers, the service has been further extended over the years. This development was achieved with others through the dealership of HTS Container Sale Systems and Palfinger Car Load Cranes. 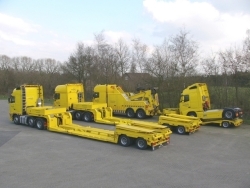 Presently, the production of semi-trailers and trailers exists mainly out of RVS (Stainless Steel) tank semi-trailers, semi heavy loader, semi-trailers and trailers, open semi-trailers with power steered axles, container trailers, and trailers and semi-trailers for the transport of round timber and middle-axle trailers in various designs and sizes. Apart from the above named products LAKO delivers open loading trays with many options, mostly combined with a Palfinger or Epsilon car-loading crane. The combination of a car-loading crane with an HTS container sale system is also possible. The delivery of complete combinations such as; car designs made to order, car loading cranes and trailers means the client has only one ‘port of call’, mirroring the well known one stop shopping, LAKO oversees the service, installations and MOT on all vehicles, everything is under one roof for the client.